How Will Mnuchin and Carson Impact CRE? By Beth Mattson-Teig (National Real Estate Investor On-line article) – All eyes have been on Washington these days as President-elect Trump continues to name key players to his team. 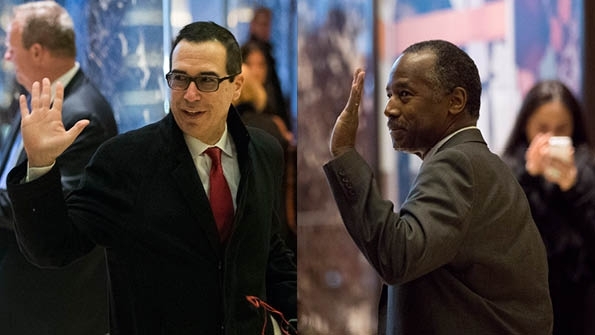 Two of the appointments that will have a big impact on commercial and multifamily real estate include Dr. Ben Carson for Secretary of the Department of Housing and Urban Development (HUD) and Steven Mnuchin for Secretary of the U.S. Department of Treasury. The two nominees have vastly different resumes for their respective positions. Mnuchin has extensive experience in banking, finance and securities. Carson, on the other hand, will face a steep learning curve in getting up to speed on HUD—a massive agency that has an annual budget of more than $48 billion. Although both will first need to secure Senate confirmation, the real estate industry is already speculating on how these two individuals could influence key policies and programs. On paper, Mnuchin certainly looks good for the job. Most recently, he was in the spotlight as finance director for Trump’s presidential campaign. However, his bigger achievements include a 17-year career at Goldman Sachs, where he oversaw trading in government securities, mortgages, money markets and municipal bonds. He currently serves as co-CEO and chairman of Dune Capital Management, a firm that he founded in 2004. “In general, the commercial real estate finance environment appreciates someone who has financial securities background and has been involved in financial markets. So from that perspective, I do think that Mnuchin is an appropriate person to be in that seat,” says Lisa Pendergast, executive director of the CRE Finance Council. “He obviously understands banking, financing, housing markets, the funding of the government and the implications of debt. So I think he is a good pick,” notes Jeffrey Adler, vice president at Yardi Matrix, a multifamily research firm in Denver. Mnuchin may take some flack in his Senate confirmation hearings due to his purchase of IndyMac in 2009. Mnuchin led a group of investors who bought the failed subprime mortgage lender. He negotiated stop loss agreements with the Treasury and then sold the entity to the CIT Group for a reported $3.4 billion. The opportunistic deal created a backlash due to thousands of IndyMac borrowers who lost their homes in foreclosure. Mnuchin will have his hand in influencing several key issues, such as interest rates, reducing corporate and personal income taxes, the future of Fannie Mae and Freddie Mac and potential reforms to Dodd-Frank. Specific to Dodd-Frank, the industry will be watching to see what steps he might take to reform CMBS risk retention rules that are set to go into effect on Dec. 24. There has already been quite a lot of time and money spent on preparing for risk retention. “So I suspect there will be more interest in refining certain aspects of Dodd-Frank rather than removing Dodd-Frank entirely or starting from scratch,” says Pendergast. One of the biggest questions facing the multifamily sector is what might happen to GSE reform under a Trump administration, and ultimately, how much government control, oversight or support Fannie and Freddie will have in the future. GSE reform can occur in one of two ways—either through the Treasury Department or through Congress. “Mnuchin has basically given us all one talking point and now we’re all trying to figure out what that means,” says Ernie Katai, executive vice president and head of production at capital services provider Berkadia. The two agencies represent a problem that was basically kicked into the next administration. They are only funded through the end of 2017. Unless something changes, the agencies will have no capital and no ability to make loans starting Jan. 1, 2018. Fannie and Freddie have been a significant source of capital for multifamily housing, with caps for market rate apartment lending in 2016 set at $35 billion each. As it relates to the future of the agencies, it is important to point out that both Fannie and Freddie have repaid what they borrowed in the bailout and are now generating income for the government. Most agree that Carson, a Yale grad and neurosurgeon, is a “pretty smart guy.” Critics have also pointed to Carson’s lack of experience in housing, urban planning or finance. Nominating a housing outsider to serve as HUD Secretary is not unprecedented. However, all of Carson’s predecessors over the past 30 years have had at least some relevant history working in the public sector as an elected official or in another government agency and/or in private sector finance. Carson would replace current HUD Secretary Julián Castro. As former mayor of San Antonio, Castro has a solid background in urban development, with initiatives that helped revitalize the city’s downtown. Castro replaced HUD Secretary Shaun Donovan, who held the position from 2009 to 2014. Donovan’s prior experience included serving as the commissioner of the Federal Housing Administration and the New York City’s Department of Housing Preservation and Development. Yet there is some optimism about bringing in someone entirely new. “Although the criticism is that he doesn’t have any housing experience, I actually think that is a pretty good thing,” says Adler. Carson is a smart guy and housing is not rocket science or brain surgery, he says. “He does have some learning to do, but the essential insight is how can he help facilitate both public and private partnerships to improve the urban environment,” Adler notes. The expectation is that Carson will build a team around him that has the expertise that he is lacking. Although Carson may come from an untraditional professional background in regards to housing policy, he is a world-renowned neurosurgeon with an inspiring life story who also has experience on the national stage as a presidential candidate, says Cindy Chetti, senior vice president for government affairs with the National Multifamily Housing Council (NMHC). But first, both Carson and Mnuchin will have to run the gauntlet of Senate confirmation hearings. The slight Republican majority that exists should help to pave the way for those appointments. In addition, one thing that Trump has done “either brilliantly or by complete accident” is that he has nominated enough lightning rods that will draw fire during confirmation hearings, says Katai. In contrast, Carson and Mnuchin could move through the approval process with far less controversy.